Are you looking for something that’s a little bigger than a normal seven passenger vehicle? Dave Arbogast Van Depot has the answer: A nine passenger conversion van. Based on the GM 2500 or 3500 chassis, the nine passenger conversion van combines all the luxuries of a normal conversion van with added room for two extra passengers. Nine passenger conversion vans are a perfect for large families and businesses. A nine passenger conversion van can also be customized from top to bottom. You can choose to include state-of-the-art entertainment systems, finely appointed leather interiors, exciting exterior design with special paint treatments and even chrome wheels. The sky is the limit when you are customizing your own Nine Passenger Conversion Van . Dave Arbogast Van Depot also has a large inventory of used nine passenger conversion vans. 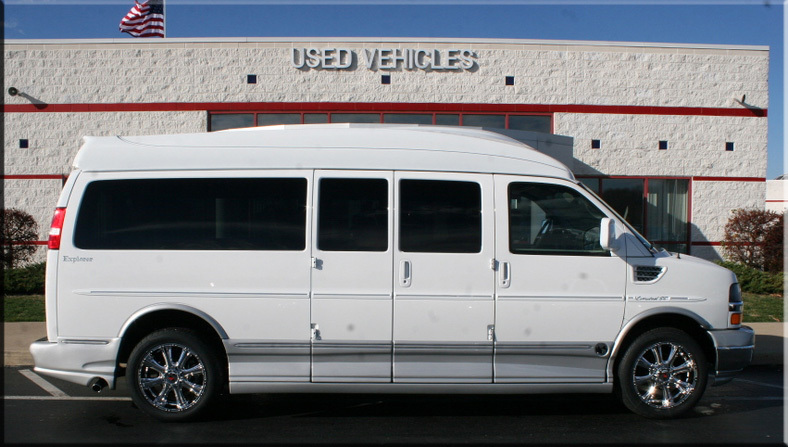 We have a team of buyers across the United States purchasing nine passenger vans. Take a look at what we currently have in inventory. If you don’t see what you’re looking for, let us know. We may have more nine passenger vans in route or can locate one for you. The Arbogast team is the most experienced in the industry. You will not find a better selection anywhere in the United States. We can deliver your nine passenger conversion van or can fly you into our local airport. Arbogast makes it easy to purchase a nine passenger van online. For more information on delivery and our online purchase process visit the purchasing online page. If you are looking for a vehicle even bigger than a nine passenger van, give us a call at 1-866-975-3287. We can specials order a custom fifteen passenger van in as little as two weeks. * 6.0 liter V-8 Vortec Gen III 300 H.P.